Things are moving fast in mobile gaming right now. For the traditional laptop to stay relevant in these tablet-filled times, it has to offer something special to offset the decreased mobility compared to its touchscreen foe. The easiest area to exploit is raw power, specifically graphics. Fruit Ninja is all well and good on an Apple iPad 2, but what if you want to play the latest DirectX 11 games on the go? 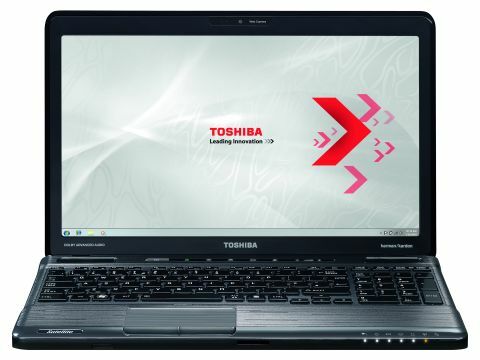 Enter Toshiba's Satellite P775-113. Under the bonnet, an Nvidia GT 540M handles the pixel pushing, which spells playable frame rates in graphically demanding DX11 titles. It's the latest in a new breed of vaguely affordable gaming PCs making the most out of rapidly advancing mobile technology. And at this price point, things are starting to get crowded. Medion's Erazer X6811 has impressively powerful CPU and GPU chops at just £899, but suffers in the build quality stakes. The Alienware M11x offers similarly impressive gaming performance coupled with Alienware's trademark excellent build quality, but corner cutting in storage and a lack of optical drive tarnishes the M11x's appeal. For the same money again, the HP Envy 14 packs AMD's Radeon HD 5650 GPU but gets some laptop fundamentals such as screen quality and trackpad wrong. The Toshiba Satellite P755-113, then, enters a price point that's certainly busy, but far from sewn up. With that Nvidia GT 540M on board, the Toshiba Satellite P755-113 is one of the quickest gaming laptops available, but it doesn't share that loud visual aesthetic with the Alienware M11x and many (too many?) gaming rigs out there. Visual design is reserved and sophisticated throughout the P755. But make no mistake, Toshiba's Satellite P755-113 is all about gaming. If you need further proof than the muscle-bound GPU and CPU, just check out Nvidia's 3D Vision kit, integrated into the machine.